On January 25, Forsage South LTD, together with Ajax Systems, organized a professional event for a wide range of companies specializing in security equipment. These are also security agencies and trading companies and engineers representing their enterpriser or business owners. For the experiment, we decided to share with impression of the past event by the participant who really wished to remain in authorless way: ..... “I was at the conference. I want to share my impressions. I will start with the positive ones.The first thing I liked very much was a lot of time devoted to answering questions from the people. On the technical side, the answers were quite informative and useful, well, and not without a sense of humor, which is important for the perception of information. It is evident that all the lecturers are technically clever, but this is logical, because they are all from the same professional field. It is so cool that new products for future sale were disclosed for specialists! You can already make plans how to improve your security system. Also it was perform the security agency representative. It was interesting to know feedback from them, because these people work most closely with the equipment and know all its advantages and disadvantages. Next, we turn to the negative impressions: I did not like the fact that there was not enough handouts and badges. Apparently the organizers did not count on such a number of participants. There were really a lot of people, the hall was full to capacity. Some didn’t even have enough chairs, it’s good that this problem was quickly resolved with the help of additional benches. In general, just pleasant impressions. The day was well spent and wish of attending such events organized by Forsage LTD only increasing ... " All of the above from our point of view as the organizers is true. Yes, farthermore, they were not ready for such a big number of people, because in our own experience of organization such events, from 15 to 25% of people usually absent! Now it was opposite - more then 115% people who were not register in advance. And this despite the fact that registration for participation was stopped a week before the day of the seminar and be absolutely necessary! 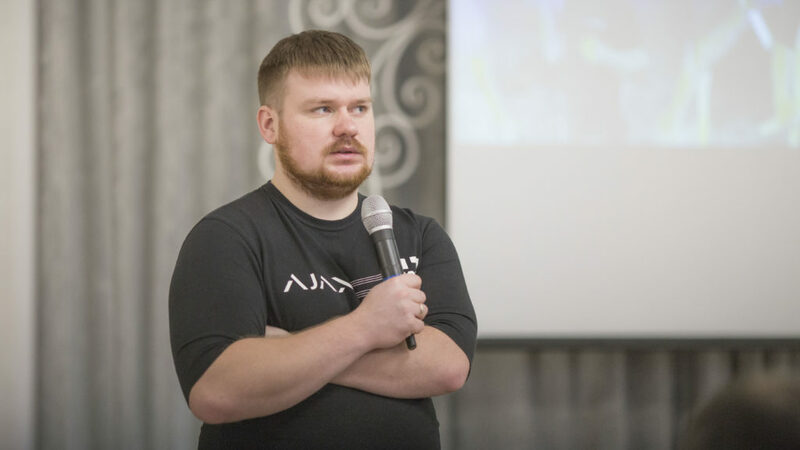 On behalf of FORSAGE LTD we would like to express gratitude to the guys representing Ajax Systems, in particular, Dmitry Kuramshin and Roman Konchakov - especially because He assumed the main burden of communication with the participants of the seminar. The information of the seminar itself took place exactly in the same way as planned and seemed to be done so that the seminar participants did not fall out of their chairs because of the boring and sleeping mood)) Before those who are not satisfied we apologize, we will continue to try to satisfy 100% of people. We will try to learn something for ourselves and apply for future events)) As a result, we offer those who were not participants of the seminar an easy excursion into the past event. To those who attended it, simply refresh some parts of that day.